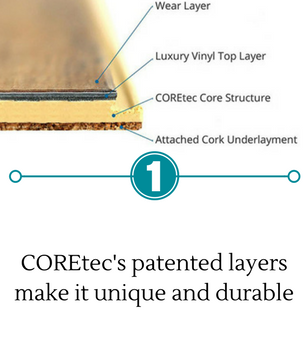 Why COREtec is the best brand in luxury vinyl? It is a great alternative to LVT that you glue down, is solid locking, or even laminate flooring. Installation is seamless and easy, and you can walk on your new floors they day they are installed due to the floating locking system. 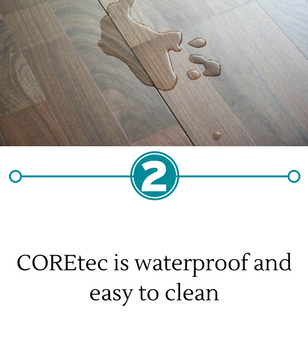 COREtec Plus’ patented assembly features the core Coretec structure made from recycled wood and bamboo dust, limestone, and virgin PVC. This construction is allergen resistant and also weather resistant, so there is no expanding or contracting. COREtec Plus is 100% waterproof meaning they can be installed in wet areas with the reassurance that they will never swell. You can get the same beautiful natural look of hardwood in your laundry rooms, bathroom, and kitchen without having to worry about water damage! COREtec Plus is tolerant and dimensionally firm. Unlike solid wood floors, COREtec Plus will not expand or contract under corresponding weather conditions. 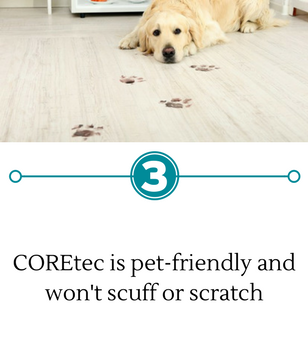 Each COREtec Plus plank has a cork underlayment making it quieter and warmer to walk on and is naturally resistant to mold and mildew, making this floor family friendly, as well as great for high traffic areas. Stop by our Greenville Carpet One showroom today in Greenville, SC and see first hand the COREtec difference! Fill out an online contact form and a flooring expert from Greenville Carpet One will contact you!